As many of you in the Blogosphere have already heard, Nick Wilford's brave step-son, Andrew McNaughton, passed away at the weekend. A little while back, the heart of the Blogosphere revealed itself by helping Nick create an Anthology in aid of raising enough money for Andrew's education. 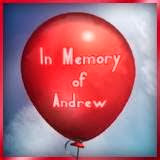 Andrew suffered with Celebral Palsy. The huge success of the Anthology proved how great this community really is and made me feel proud to be a part of it. This virtual red balloon is now floating around the blogosphere in honour of the life and legacy of this amazing young man, and I'm giving it a little blow to help spread it just that little bit further. Thanks to Mark Koopman for spreading the word. Coming together to remember, Andrew. Thoughts and prayers with Nick and family.